It is a truth universally acknowledged that instant messaging has issues. Regular users of any form of instant messaging will have, at some point, experienced a message lost in translation because tone has been lost entirely. Is that laughing face emoji sarcastic, or sincere? Does a typed out “fine” really mean fine, or are you in deep trouble? Instant messaging is riddled with miscommunication problems – and the emoji has been designed to add those missing social cues. So, customer service teams are turning to the emoji in a bid to better engage their audience and humanise communication. That doesn’t mean that it always works. Here, we investigate the use of emojis in live chat, and whether they help or hinder. Live chat software is a highly useful tool for communicating with customers in real-time. However, it’s not without its limitations. The fact of the matter is that communication is more than just typed words and sentences. To properly understand the person you’re interacting with, social cues need to be evaluated constantly. In a face to face conversation, you can easily uncover the real meaning behind words by physical signals such as tone, expression and body language. In typed chats, you’re reliant on letters alone. For businesses using chat, this can present a challenge in detecting when a customer is joking, becoming aggravated or using sarcasm, for example. Agents are tasked with interpreting this ambiguity and responding in the best possible manner. So, what can be done to clarify online customer communications? Enter emojis in live chat. Customer service chats are not exempt from this. If a customer is in a bad mood when they launch a session, they might read an agent’s plain text account questions as blasé or unfriendly. Similarly, a jovial agent might not pick up on a customer’s sarcasm. For all its utility, chat can be a minefield of missed messages. • Perfunctory: How are you? They might just be a few rearranged pixels, but those different pictures portray worlds of unwelcome meaning. Emotion is powerful, and that’s why emojis are too. Emojis can be so indicative of tone that the difference between a colon and a semicolon is the difference between friendly and creepy. Ultimately, that is why the use of emojis in live chat sessions can fill the gap of tone – but are also dangerous to use frivolously. Emojis were designed to indicate tone, and for a while, they were hailed as an attempt at a global language. Emotions are universal, after all. Everyone will understand a smiley face as denoting something positive. By using one, you can appear friendly worldwide, regardless of language or messaging channel. But a problem is hit with cultural differences. For example, the thumbs-up emoji would be considered positive in the US or UK. In Iran, it’s considered an insult. Therefore, it is important to understand what the emoji means, what emotion you want it to convey, and which audience you’re targeting. While the jury’s out on whether emojis deserve the title of ‘global language’, they do provide a method to express what some people struggle to put into words. 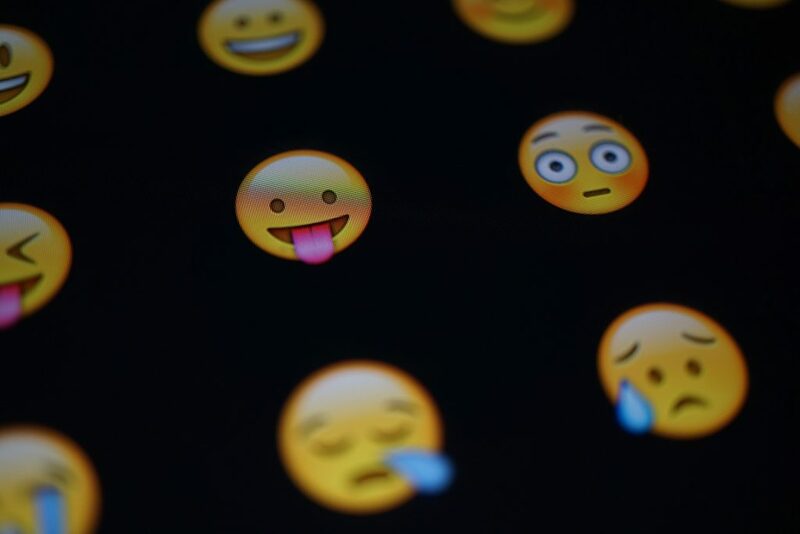 Because emojis denote emotion, their use in live chat software can help humanise your brand. Used correctly they’ll create a friendly yet proper tone, rather than a tone that is too formal. They also provide your customers with a feeling of freedom. Written language can be restrictive, and it’s not always easy to put your feelings into words. It is, however, easy to tap an image that conveys your mood in one quick click. Emojis can liberate your chat language. Users can feel like they’re interacting with your brand as they’d interact with their friends in instant messaging apps, and feel more relaxed as they talk to your customer services team. In turn, the simple addition of emojis in live chat can create comfortable customers who have a positive experience onsite. There can be no doubt that emojis are modern and relevant. In 2015 an emoji was genuinely named Oxford’s word of the year (congratulations to this little fella 😂). Unfortunately, with every silver lining, there’s a cloud. And with emojis, that’s the ease of misinterpretation. Because emojis are, put simply, tiny pictures, you can interpret them subjectively. One person might interpret a fist emoji as a companionable fist-bump salute, another might think it denotes aggression. All this is before you take font variations into account, where an emoji may look different on different platforms or devices. The importance of suitability was learnt the hard way for House of Fraser, whose ‘emojinal’ Twitter campaign left customers wondering if the company’s accounts had been hacked. Meanwhile, Domino’s has demonstrated how to effectively use emojis to further their customer relations in chat and conversation, by allowing customers to order pizza simply by texting a pizza emoji to their order hotline. There is no doubt that emojis are useful for attracting millennials. When asked whether they are “more comfortable” expressing emotions through those visuals than through phone conversations, 68% of millennials agreed, compared to 37% of those over the age of 65. But does that mean that in your pursuit of the youth vote with emojis, you’re risking alienation of older customers? The key here is moderation. Spewing out a series of emojis in live chat will cause confusion to anyone, especially those who don’t use them constantly. One or two simple emojis with generally clear meanings, however, aren’t going to lead to confusion and could make your messages clearer to everyone. There are clear benefits of using emojis in your live chat sessions with customers, but it’s best to take them with a pinch of salt. Tread carefully, understand your audience and your emojis, and use them sparingly. Too many could leave you annoying and alienating customers, while one or two gives a friendly, approachable character to your brand, and can improve emotional understanding behind the words used.